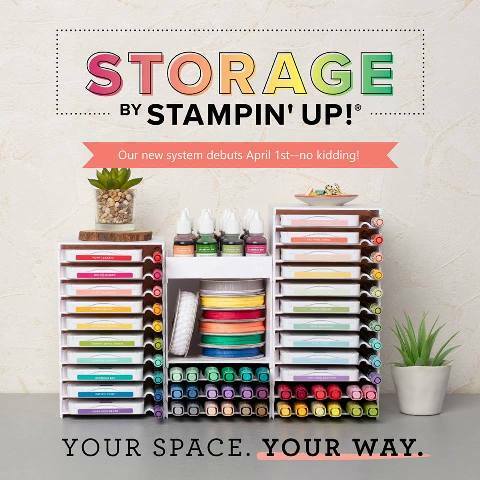 Here are some videos to show you new products while you wait to view the catalog.. Remember you can order Sept 1!!! Another bonus is NEW SPECIAL OFFERS that last for 3 weeks starting Thursday. You will be getting new items each week. You will find this weeks SPECIAL OFFERS BELOW! Labels: Frances Wagner, Holiday Catalog- Sept 1, Special Offer, Stampin' Up! 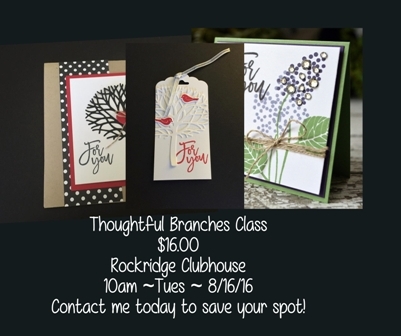 Every 1st Thursday (unless it lands on a holiday) I have a card class at Rockridge Clubhouse from 10-12pm for $16 unless otherwise stated. The first of the month sort of sneaked up on me with all my energy going to my New Holiday Catalog over the weekend. But what fun we had making a new card and looking at the fabulous new catalog. The card class this Thursday is really a Christmas card and the rest of cute tags for the fall. I sometimes get so excited about the Christmas stuff I over look the fall holidays. Here are a few samples. Contact me to reserve your spot. Thursday 9/1 is also the first day you can order from the new catalog. I will be sending out a pdf file for the catalog on Thursday if you want to view it. 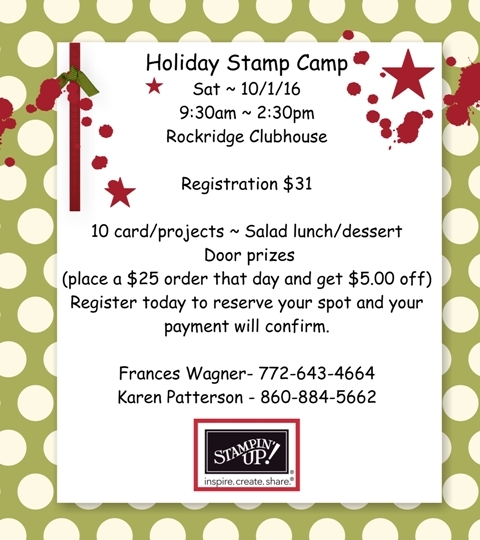 If you are in my Stampin Bunco group or stamp club you will get one too. If you were not able to get to my catalog launch on Sunday and have ordered from me since the large catalog came out in June I will have one for you. Here are some samples we made to show you new ideas for the new catalog. Sometimes my customers find me on line and I never meet them, well this was a great event I got to meet 2 of those customers (I have to say here they start out being customers but end up being my friends - that is the best part about being a demonstrator for me the people I meet and the friends I make.) 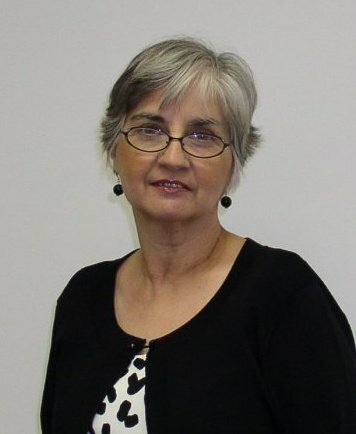 Below is Becki who recently moved from Pennsylvania, so glad she found me on line. This is Betty that found me a while ago. Just wanted to share part of our day with you. 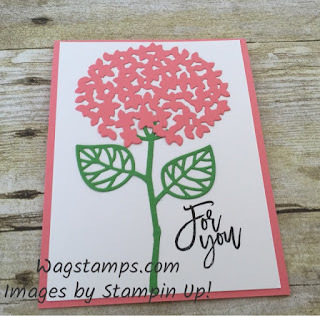 Last but not least, tomorrow Wednesday 8/31/16 is my 17th anniversary with Stampin' UP! I joined 8/31/99 to get the discount and never looked back. I have never had trouble making my quota, I have never used my families money to buy stamps and supplies. I am blessed beyond measure to have so many great customers and team members and love what I do. 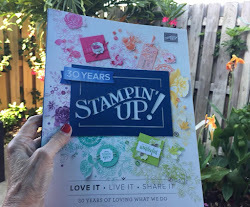 I can't imagine NOT being a Stampin' UP! Demonstrator. At one time I had my dinning room and kitchen painted and bought new counter tops with my SU commissions and we have been on vacation with my SU commission. It is all good. Soooooooooooooo- to celebrate: Wednesday 8/31 ONLY I am going to offer a 10% discount before tax and shipping to anyone that places an order from me. You can order on line and when I see it I will send you a check or if you order through me personally I will deduct it from your total. Thanks for your support over the years. Today was an exciting day! I held my New Holiday Catalog Launch and everyone loved it. 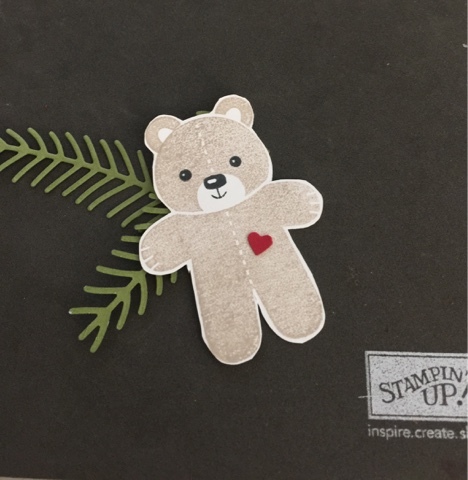 The card below is the make and take we did. 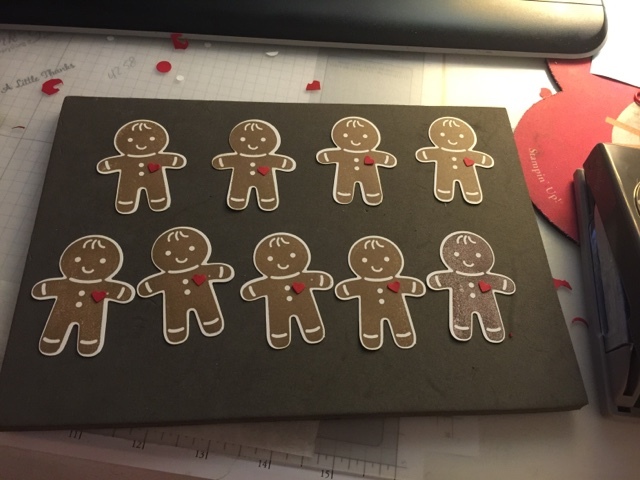 Who doesn't like gingerbread men right? 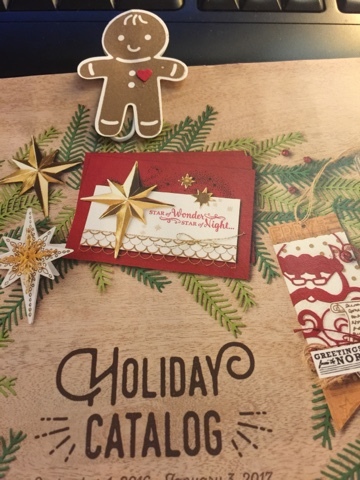 This is a sweet bundle with the Cookie Cutter Christmas set and the punch. Don't forget there is also a Halloween set that matches that punch. The new catalog goes live September 1st, let me know if you don't have a catalog and do not have a demonstrator that you currently work with. I will also have a link to the catalog on my blog September 1st so you can view it here. Wait don't go!!! 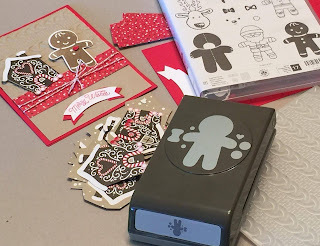 Did you notice the Cable Knit embossing folder. 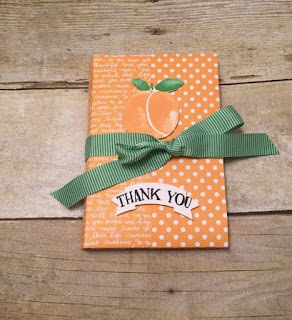 It make a beautiful background and even strips of it on a card or scrapbook page. If you are a knitter you are going to love it to make sweet tags for your knitted gifts. Be sure to check it out September 1st here on my blog. Another great gift giving idea. 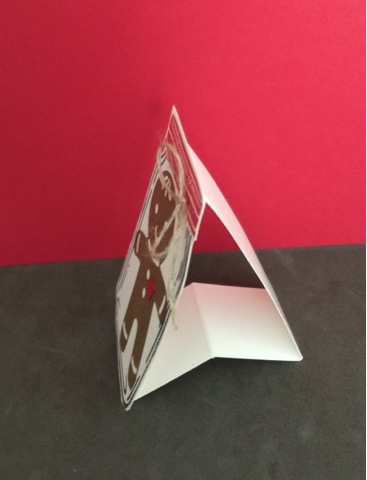 A matchbook for enclosure cards or fold over tags. This set has endless possibilities! 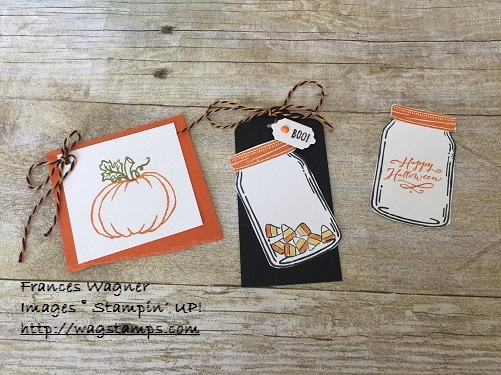 Contact me today to have your friends gather to make tags and cards. Thanks for stopping by! 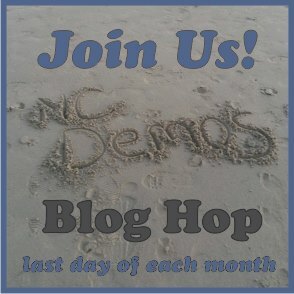 Don't forget to check out the rest of the NC SU Demos blog hop! 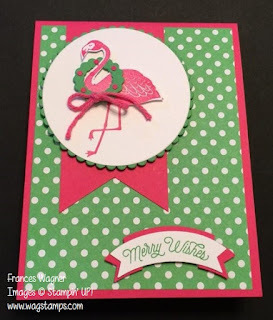 Pop of Paradise Christmas Card ~ I was playing with some old and some new toys today and I knew when I saw the Santa's Sleigh Thinlits the small wreath would be the right size for the flamingo. Living in Florida it is a great Christmas card for me. Get your box of fun today! Buy your first month and get your second month FREE. For the FIRST time ever, FIRST-time buyers can buy their FIRST month and get their second month FREE! Offer Details: When you use promo code “BOGO” at Paper Pumpkin, you’ll pay the regular price of $19.95 and get their second month for FREE! invalid if subscription is suspended or cancelled during the first two months. 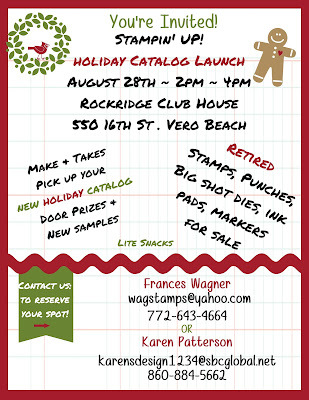 I have been working/playing with new products from the Holiday Catalog getting ready for my New Holiday Catalog Launch. If you are local make sure you come to my New Catalog Launch this Sunday 8/28/16 from 2pm 4pm floating (drop in at any time). Please RSVP so we can prepare for you. It's just too hard to decide what I like most. I may have to say Cookie Cutter Christmas is one of my favorites. You can see below you can stamp a bear, gingerbread man and not shown is an Eskimo, Santa and a Deer and a punch makes it quick and easy to make cute, cute stuff. You are going to want this Cookie Cutter Christmas Bundle. Wait there is more, there is also a Cookie Cutter Halloween set that goes with the punch too. 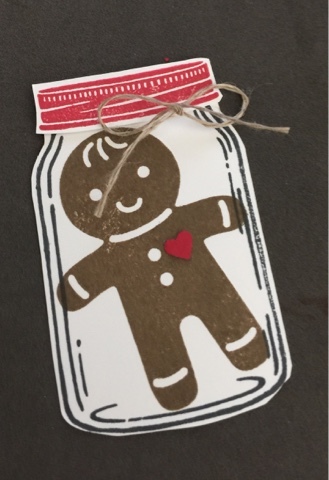 Stop by on Sunday and see some adorable samples we have made for you. Below is my stash from my first pre-order. 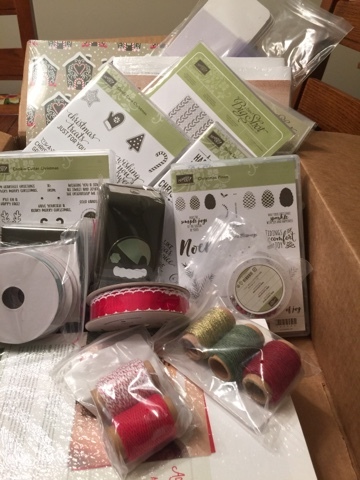 That is one of the things I love about being a demonstrator, getting to order new products early. I can't wait to share them with you at an upcoming class. 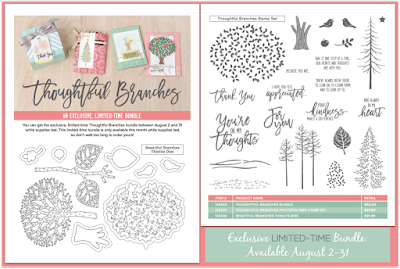 Don't forget you have a few more days to order the Thoughtful Branches Set only available in August while supplies last. August 31st last day to order. Coming Soon!!!! The new Holiday Catalog. 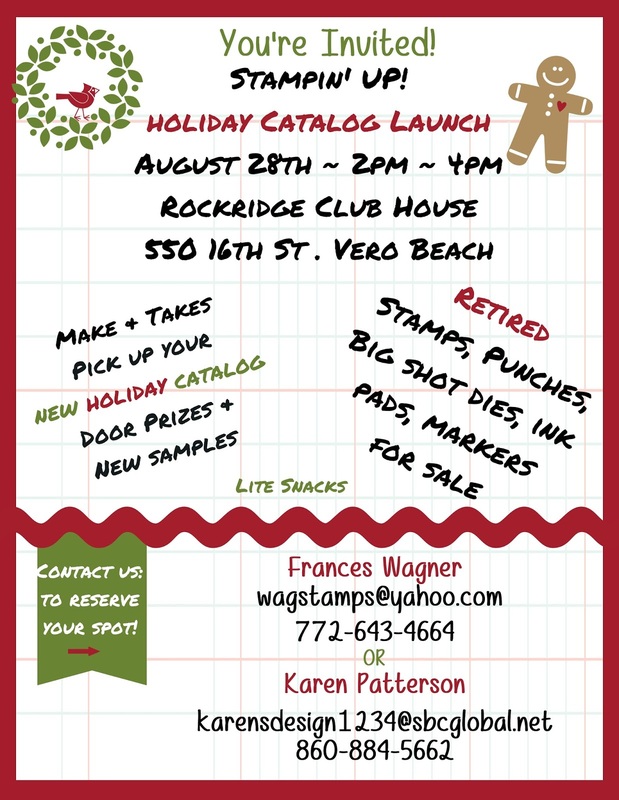 You can order from it in September but stop by my New Holiday Catalog Launch 8/28/16 at 2pm to see lots of new samples and pick up your new catalog and create a fun make and take. RSVP today so we can prepare for you. 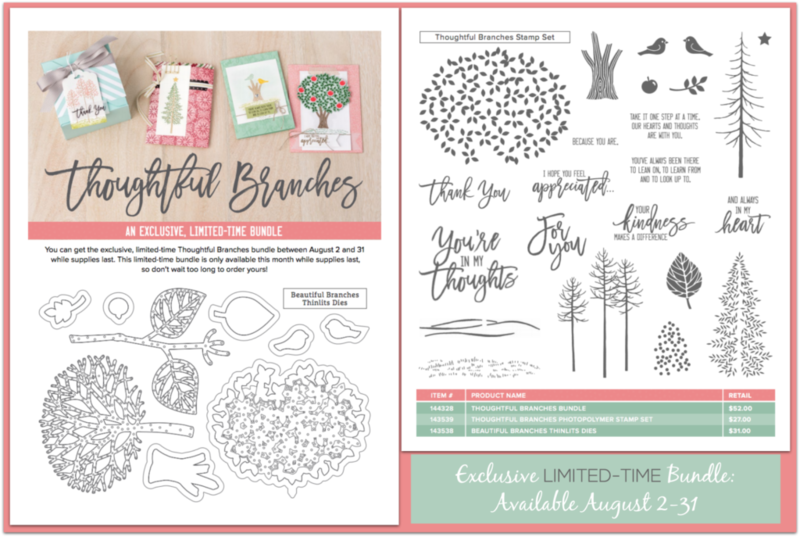 Thoughtful Branches Welcome to my Team!! This is a new card using the NEW Thoughtful Branches stamp set and (Welcome Words) a retired set but it is so perfect when you have a new team member. I am sending two of these out this week to my to new team members. I am so excited to have Linda Pierce from Charles City, VA and Karen Patterson from Sebastian, FL on my team. Welcome girls. I just love this Thoughtful Branches Set that you can only purchase the month of August. 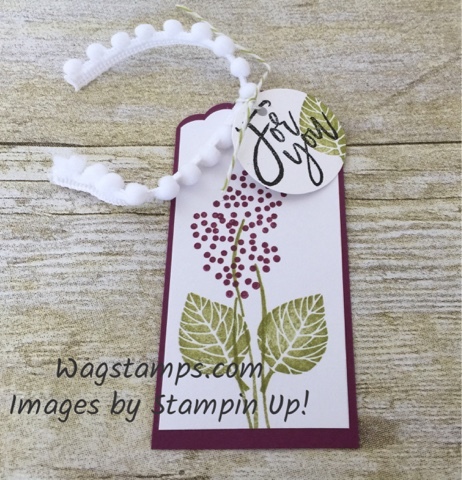 I was playing around with tags today and came up with this one. The flowers sort of remind me of lilac's but for the stamp set they are really suppose to be leaves on small trees. Who knew. 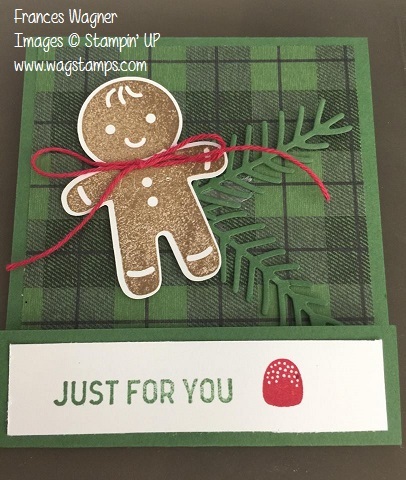 I can see some Christmas tree cards with this set too, it is so versatile. 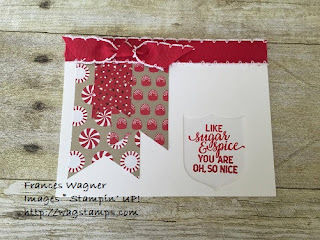 Last but not least today I am sharing the card that was the prize for my Facebook Stampin Bingo game I have every Tuesday night at 8pm. Let me know if you want to play (US players only) and I will invite you. This will be going to Wendy Fletcher, in Spotsylvania, VA one of our winners, she requested the Thoughtful Branches Card using one of the IN colors and I used flirty flamingo color. 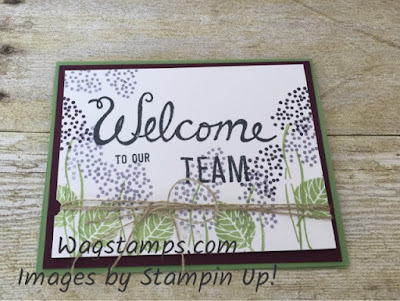 I usually show the Stampin Bingo Players something I have been working on the week before and sometimes I will have something for them to choose sometimes I choose. The main thing is we all have a fun time. Email me wagstamps@yahoo.com or facebook message me if you want to play. See the flyer below and you can click on the image to make it larger. For a limited time (August 2- 31), you can get the new exclusive Thoughtful Branches bundle. Plus, if you order in August please use hostess code TYZ7C97R for extra free items from me! Thanks for stopping by and don't forget if you earned Bonus Day's Coupons you need to use them this month. Contact me if you have any questions. Last week I was in a blog hop with Demonstrators in North Carolina and we don't tell each other what we are posting on before hand but we have a theme. July Theme: Favorite Consumable (DSP, Embellishments, Ribbon) One of the other demonstrators (Jo Anne Hewins) used the same set I did Fresh Fruits. However I loved her idea, so I asked if I could case her idea for a class and she said yes. 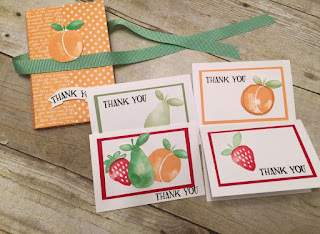 So for my class this week I am offering this cute class using the Fresh Fruit stamp set. 8/4- Fresh Fruit Class - Rockridge Clubhouse 10am - $16.00 Includes 4 cards/envelopes with a cute holder. Check out the samples and sign up today. They can have either Happy Birthday or Thank You!